Vijay Luxmi Oil Expellers are specially designed & manufactured providing robust construction. The performance of the Expellers is most satisfactory & efficiency can complete any foreign Expeller for economic running. It requires minimum space for erection, power consumption is very low and very simple even an unskilled mistry can operate it easily. All kinds of seeds can be crushed such as Groundnut, Linseed, Copra, Mustard, Palm kernels, a Poppy Seed, Rap seeds, Soya beans, Sunflowers/seeds as per details . Body:The body, made of heavy duty closed-grained and seasoned casting to ensure `vibration free operations. Gear Box: Made from Graded Cast Iron to ensure smooth and safe operations. The steel milling cut gears and additional reduction helical gear set are fitted. 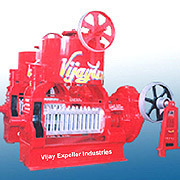 Established with the profound understanding of the oil expelling industry, we-Vijay Expeller Industries, are engaged in manufacture and export business of Oil Expellers, Copra Cutter, Filter Press, Neutralizer, Worms and Gears for Oil Expellers, etc. Over the years, we have attained expertise and sufficient cognition in our field of operation. We have maintained our industrial repute by implementing our expertise and experience in devising high performance and hassle free machines. The sturdy construction design and their efficiency to economize energy and other resources make our machines most coveted option available in market. The compact structural design is specially engineered so that they occupy minimum operational space. We are perpetually growing in this sector with the continued support of our experts and technical personnel. Their perseverance is evident in their efficiency to develop standard and custom designed machines while adhering to timely schedules.